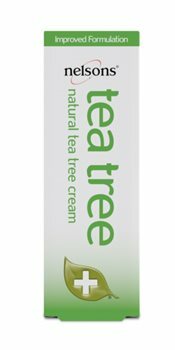 Nelsons Tea Tree cream is a natural first aid antiseptic prepared using the finest, purest Tea Tree oil from Australia. Tea tree oil from Australia. Apply gently to the appropriate area. Can be applied as often as necessary. Keep all medicines out of reach of children. Side effects are rare. If you notice anything unusual or symptoms persist, consult your doctor. If pregnant or breastfeeding consult your doctor before use. Do not use if sensitive to any ingredients. Do no use after the expiry date shown. Store below 25C. like all of Nelson products it works very well and the grandchildren saidthey like it!